In a way, a skincare routine can be quite overwhelming, but I have learnt that as you indulge in it, overtime you find that you become better able to streamline it to suit your needs. This is exactly what happened in my case. In the beginning, during my quest for the ‘perfect skin’ (which, by the way, does not exist), I tried out every latest ‘fad’ there was, clarisonic, foreo, you name it! But I have now discovered what routine works best for me and today I am here to share that. Please note I am not advising you follow my exact routine, Skincare is very much a personal subject, what works amazing for Jane may be horrible for Susan, so please I am not recommending anyone follow my routine, I am no expert, and I am simply sharing! Disclaimer out of the way, let’s get into it! My routine in the evenings is much longer than in the morning. Because after a long day, I need to make sure I get all the makeup and grime off. Yes, I am a double cleanser and you will see why in a minute. 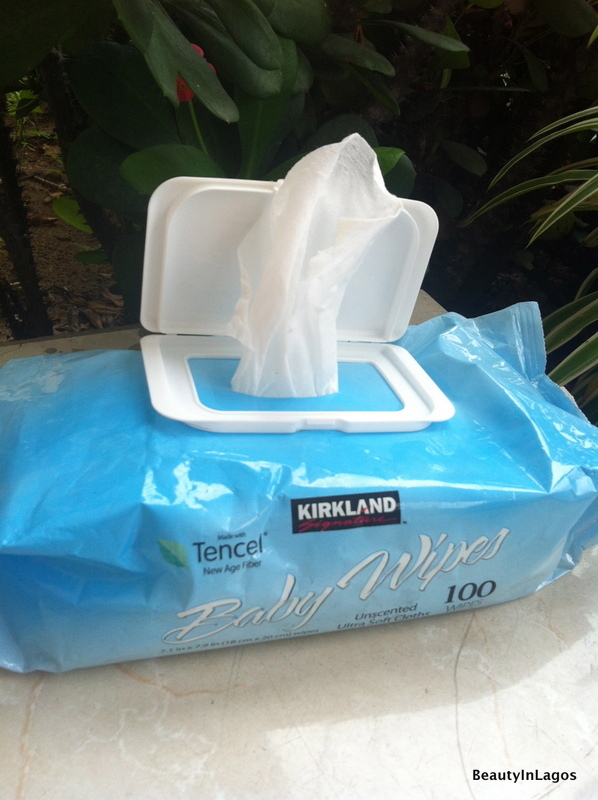 For my first cleanse I use Baby-oil and Baby-wipes. “Why Baby products?” you ask, because I personally believe anything formulated for a baby’s skin will be mild enough to work for even the most sensitive of adult’s skin. The wipes pictured above, are the absolute best art getting the job done, they are much thicker than regular wipes and very ‘wet’, so just glide smoothly over the skin without tugging. I literally only need one wipe for my entire face. I use the baby-oil to get my eyeliner & mascara off. This combination literally tackles ANY sort of eye makeup, no matter how waterproof… Trust me, I’ve tried it out on everything. I just pour a little bit of oil into a wipe, and then hold it over my closed eye for about 15-20secs and then wipe, everything comes up. One thing I’d advice strongly is to make sure the baby-oil is safe enough to go over your eyes, there are some oils that state ‘avoid eye area’, so please, read the instructions on the back. You can always substitute the baby-wipes and oil an actual makeup removers if you prefer. After I’ve got my layer of makeup off, I then reach for one of the oils, balms or gels above. I apply these to dry skin ALWAYS. The reason for this is kind of similar to why I apply my conditioner to dry hair, which I explained here. So I apply it to my dry face, using the tips of my fingers, bringing it down to my neck (always extend whatever skincare product you use on your face, to your neck and décolletage…. Always!). After I have massaged my cleanser in, I then emulsify my adding some water to my face and massage again. I don’t rinse my cleanser, I take it off using a flannel. A flannel is really just a fancy name for ‘face towel’ and these are readily available in Lagos. I bought most of mine at Ebeano Supermarket for NGN300 a pop! So I wet the flannel in warm water (the hotter the better), wring a little of the water out and then wipe my face and neck. I repeat until it’s all off. It’s not absolutely necessary you use a flannel to get the cleanser off, you can rinse. But experience has taught me that the flannel is better able to get everything off than just water and your fingers. Also I use a new flannel everyday, because do you know how much bacteria can reside in a wet flannel??? So I suggest you buy about 8 flannels, one for everyday of the week and the 8thone for when you’ve put the other 7 in the wash. By ‘one for everyday’, I mean you can use the same flannel for your morning and night routine. So use the flannel a maximum of 2 times before you have to wash it. Once my skin is now nice and clean, it will be better able to benefit from anything else you would like to apply. I use a mask, once a week usually on Sundays. And the masks I use are pictured above. After all the cleansing and exfoliation I re-hydrate my skin by spritzing some Rose Water on it. There are various toners out there for different skin needs, I just prefer to use this. And lastly before I go to bed I massage some oil into my face. People still believe that oils are no good for oil-skin and that couldn’t be further from the truth. Oil is actually good for you skin, especially for repairing it overnight. My morning routine is very ‘short and sweet’, I don’t like to do too much, because of time. And also I may be wearing makeup and I don’t like to layer so much. Once I’m out I apply my face cream, and it must have SPF in it. The one I typically use is pictured above. After which I carry on into my makeup routine and that’s pretty-much it! I also supplement my routine with regular facials, I tend to get one once a month. Someone once asked me are Facials an absolute necessity and I responded Facials are like exercise for your face. Exercise is good for everyone, but do we all exercise? Wow.there's not a lot you do and you have perfect skin. Does this mean you also don't visit the spa for facials? If you do, can you pls give us tips on getting facials.–> why do we really need it? Wow! You put my routine to shame! Pls where can we get d origins clay mask? I’m coming back to this post after 3 years and it is still very useful. Thank you. I use these same steps now for my new skincare routine although with different products. ?